Reducers are used when it is necessary to change the duct size to either a larger or smaller duct. This plastic reducer will reduce from 200mm to 150mm. Reducers are used when it is necessary to change the duct size to either a larger or smaller duct. This reducer will reduce from 250mm to 200mm. Reducers are used when it is necessary to change the duct size to either a larger or smaller duct. This reducer will reduce from 300mm to 250mm. Reducers are used when it is necessary to change the duct size to either a larger or smaller duct. This metal reducer will reduce from 250mm to 200mm. Reducers are used when it is necessary to change the duct size to either a larger or smaller duct. This metal reducer will reduce from 200mm to 150mm. Reducers are used when it is necessary to change the duct size to either a larger or smaller duct. This metal reducer will reduce from 350mm to 300mm. Reducers are used when it is necessary to change the duct size to either a larger or smaller duct. This metal reducer will reduce from 300mm to 250mm. Reducers are used when it is necessary to change the duct size to either a larger or smaller duct. This metal reducer will reduce from 250mm to 150mm. Reducers are used when it is necessary to change the duct size to either a larger or smaller duct. This metal reducer will reduce from 150mm to 125mm. Reducers are used when it is necessary to change the duct size to either a larger or smaller duct. This reducer will reduce from 200mm to 150mm. Reducers are used when it is necessary to change the duct size to either a larger or smaller duct. This metal reducer will reduce from 125mm to 100mm. Reducers are used when it is necessary to change the duct size to either a larger or smaller duct. This metal reducer will reduce from 150mm to 100mm. Reducers are used when it is necessary to change the duct size to either a larger or smaller duct. This is a variable plastic reducer and can be used for sizes 150mm to 80mm. Metal joiners are used to join lengths of ducting together. 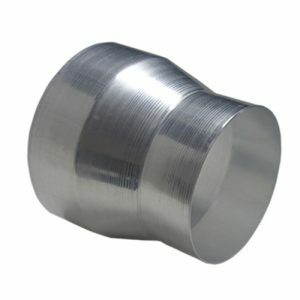 Suitable for all types of ducting, can connect to a 150mm size. Metal joiners are used to join lengths of ducting together. 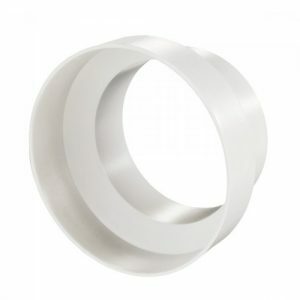 Suitable for all types of ducting, can connect to a 125mm size.